Delhi the capital of India, is a historical city, which attracts the tourists because of its historical past. This city is one of the oldest city with lots of monuments and temples that are a sight to watch. Any visitor's visit to this city will go incomplete without a visit to these historical places. Delhi is a 1000 years old city with great market places which fancy of a lot of exquisite stuff which is worth having a glimpse of. When you arrive at the airport in New Delhi you will be received by the representatives who will then take you to the Hotel. Overnight at New Delhi. Morning after breakfast transfer to New Delhi Railway station to board a 2nd A/C Sleeper class train to Sawai Madhopur (Ranthambhore) at 0750 hrs. Arrive Ranthambhore at 1250 hrs and transfer to Resort. Lunch at the lodge and afternoon game drive to the national park with an English-speaking Naturalist. 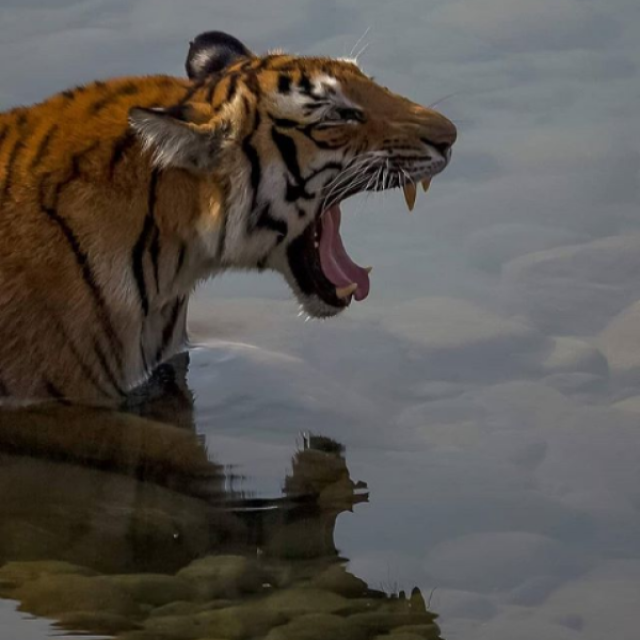 Ranthambore: With an area of 400 sq. km encompassing rocky hill crests which descend to open valleys between the Aravalli and Vindhya ranges, dotted with water pools and fruit trees, this park gets its name from the thousand year old fortress, which looms above the forest. Well known for the diurnal activity of tigers, Ranthambore is a very special and unusual area where a natural present meets a historical past. Sambar, cheetal, chinkara, nilgai and languor. The elusive leopard and tigers are found in this reserve with tourists standing a very good chance of seeing tigers during the day. Dotted across the landscape are the crumbling ruins of its past glory, be it chatris or cupolas, like palaces or old guard posts, all of which reinforce the magical and ethereal quality of this great wilderness. Dinner and overnight at Resort. Morning & Evening drives in the park. Breakfast, lunch and dinner at resort. 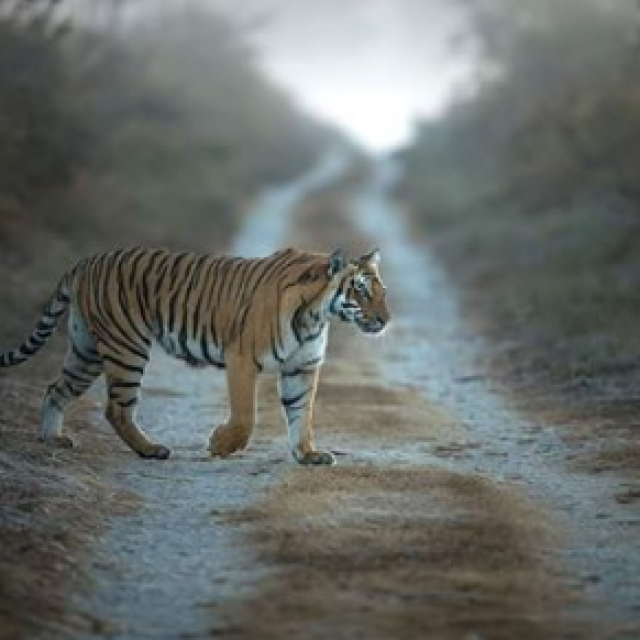 Overnight in Ranthambore.During the day visit the famous Ranthambhore Fort. (12 kms. from the Resort) Perhaps the only one fort, which is not visible from a long distance. The Fort is a massive enclave and quite high. Mughal Emperor Shah Alam gifted it to Sawai MadhoSingh I of Jaipur in 1754 AD and since then it was maintained as the private hunting preserve. Much later, Queen Elizabeth II and Duke of Edinburgh were part of the Royal Hunting, who stayed here too. It's a unique Rajput Fort. Archeological Department took it in 1964. It is 1578 ft from the sea level and 750ft from ground. Total area of the fort is about 7 miles. There is no drive way up to the fort, just the stairs. There are three big artificial lakes up in the Fort. Overnight at Tiger Den Resort. Morning game drive to the national park and later drive to Bharatpur 210 kms. On arrival Check into Hotel. Evening visit to the sanctuary. Bharatpur is popular for its bird sanctuary - the Keoladeo Ghana National Park - finest in Asia, in which over 400 species of water birds. The sanctuary covers an area of 40 sq. km of swampy, lightly wooded terrain that was once the private hunting and shooting preserve of the Maharaja of Bharatpur. Today it is the protected breeding ground for many species of birds and also the home of migratory birds, especially of the Siberian Crane, that spends its winter here. Colonies of cormorants, spoonbills, storks, egrets, herons, pelicans, ibis and grey herons can be spotted all over the park, besides a fairly rich habitation of deer and snakes. [The best time to visit the park is from October though March] The park can be explored either by cycle rickshaws (the drivers are all very capable naturalists) or by boats on the lake. Overnight in Bharatpur. Morning : Visit the Bharatpur Keoladeo Ghana Bird Sanctuary by cycle rickshaws (the rickshaw drivers are all very capable naturalists and drive from the wilderness of the forests to the places of historic significance that marks our beginning to the next place of your trip is Agra. Agra is famous as the home to one of the Seven Wonders of the World - the Taj Mahal. The architectural splendour of the mausoleums, the fort and the palaces in Agra is a vivid reminder of the opulence of the legendary Mughal Empire. Agra was their capital for nearly a hundred years from 1564. A pleasant town, with a comparatively easy pace, Agra is known for its superb inlay work on marble and soapstone by artisans who are hereditary crafts persons. After Lunch visit the Taj Mahal - the inimitable poem in white marble. Built over a period of 22 years, by the Mughal Emperor Shah Jahan in 1630, for his Queen Mumtaz Mahal to enshrine her mortal remains, it is one of the seven modern wonders of the World. [ The Taj Mahal is closed on Fridays). Afternoon drive to New Delhi 220 kms/ 5hrs drive. On arrival check into Hotel. Overnight at New Delhi. Morning after breakfast transfer to airport to board a flight to Guwahati at 1010hrs. Meeting and assistance on arrival at Guwahati airport at 1215hrs and drive to Nameri National Park 250 kms/5hrs drive. Dinner and overnight at Eco Camp. Morning boat ride in Jia Bharoli river, followed by birding trip, overnight at Eco Camp. Morning boat ride in Jia Bharoli river, followed by birding trip and later drive to Kaziranga National Park 250 kms/ 5hrs drive. Dinner and overnight at Resort in Kaziranga. Kaziranga National Park lies partly in Golaghat District and partly in Nagaon District of Assam. It is the oldest park in Assam covers an area of 430 Sq. kms along the river Brahmaputra on the North and the Karbi Anglong hills on the South. The National Highway 37 passes through the park area and tea estates, hemmed by table-top tea bushes. One can even see the rhinos and wild elephants straying near the highway. Kaziranga National Park a world heritage site is famous for the Great Indian one horned rhinoceros, the landscape of Kaziranga is of sheer forest, tall elephant grass, rugged reeds, marshes & shallow pools. It has been declared as National Park in 1974. Kaziranga National Park is one of the last areas in eastern India undisturbed by a human presence. It is inhabited by the world's largest population of one-horned rhinoceroses, as well as many mammals, including tigers, elephants, panthers and bears, and thousands of birds. The park is open from November to April. Tourists can take rides on elephants to move around the park or cruise in a boat on the Brahmaputra along the park. Morning and afternoon game drives, meals and overnight at Resort. Kaziranga National Park offers different safari option for wildlife enthusiast to see the wild animals in their natural habitat. 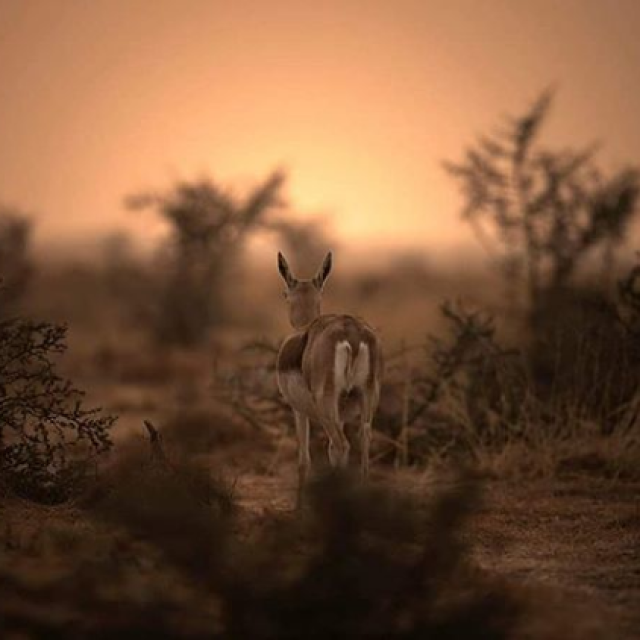 The best time to visit the park for safari is Nov to May. Safari can be under taken by Jeeps and Elephants only. 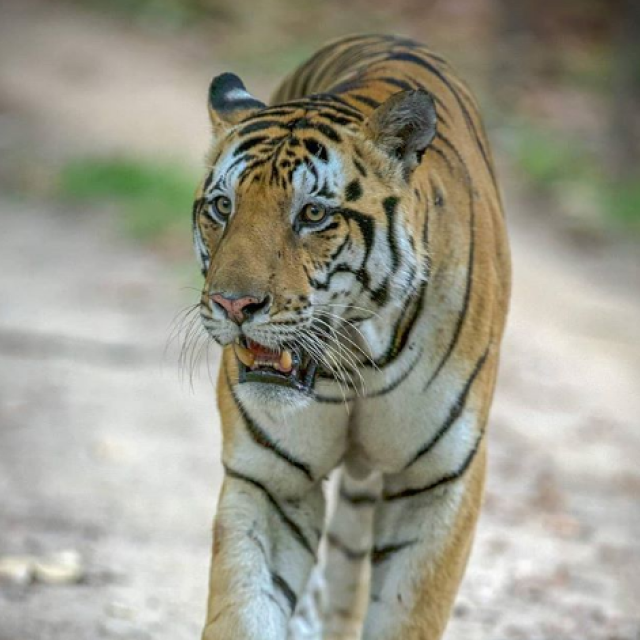 During safari into the national park you may spot animals like the tiger, rhino, water buffaloes, wild boar, gaur, leopard, cats, blackbucks, otters, monitor lizard, barasingha and of course wild elephants. Kaziranga has a large population of colorful birds. Some of the birds that can be commonly sighted during your Kaziranga wildlife safari are the flamingoes, cranes, grey-headed fishing eagle, whistling teal, crested serpent eagle, open-billed stork, swamp partridge, osprey, cormorant, herons, marsh harrier and other birds. Flight+5hours DriveMorning game drive to the park and after breakfast drive to Guwahati 250kms to board a flight at 1420 hrs to New Delhi . Overnight at New Delhi. Morning free for leisure activity and later transfer to airport to board a flight back home. Note: The driving hours given above from one city to another are based on the normal conditions of the roads. Any break for food / tea / toilets / sightseeing on the way will take extra time than the above given hours.